<Previous WINARNI: I believe in Modern Cancer Hospital Guangzhou and everything is getting better now*. I am Susan Gawat, 58 years old, from the Philippines. I was diagnosed with breast cancer stage IIA. In 2014, I took mastectomy and intravenous chemotherapy in the Philippines. However, in July, 2015, the cancer came back with lung and liver metastases. And then I received treatment in St. Stamford Modern Cancer Hospital Guangzhou. After taking interventional therapy and natural therapy, I have gotten improvement and I’m in stable and good condition now. I’m a single mother with four children. So far, I have worked in hospital for 28 years. I was quite contented with this peaceful and happy life before. However, suddenly breast cancer disturbed my life. In August, 2014, I accidently found a lump in my left breast, and I went for check-up in the hospital where I worked. I was diagnosed with left breast cancer. At that moment, I thought my world completely collapsed. But, my families, friends, colleagues supported and encouraged me to fight against cancer. 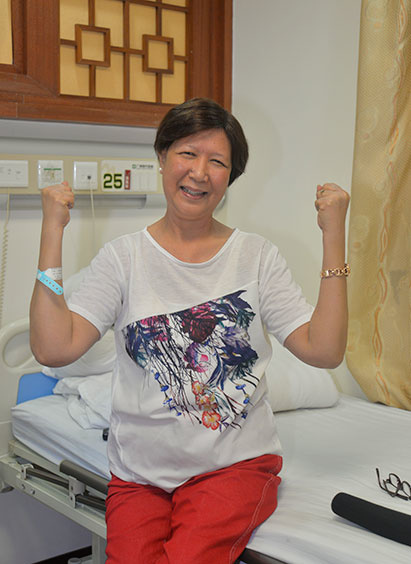 I began to fight bravely, and in September, I received mastectomy in the Philippines. In order to prevent cancer metastasis, I took both breasts away. After the surgery, I got 4 sessions of intravenous chemotherapy, and finished all the treatment which my doctor recommended. I felt better and went back to work. I thought these painful days were over. Unfortunately, cancer returned in July, 2015. I got pneumonia and coughed for a long time, which could not be alleviated by drugs. My doctor advised me to take CT scans and X-ray, from which I was diagnosed with lung and liver metastases. There were small nodules in my lungs and liver, which meant that the cancer recurred. I felt very sad again and cried, so did my families. My doctor in the Philippines also suggested me taking chemotherapy. But my daughter found St. Stamford Modern Cancer Hospital and minimally invasive therapy with fewer side effects. In September, 2015, I arrived at St. Stamford Modern Cancer Hospital with my daughter. Firstly, maybe due to the jet lag, I vomited and felt uncomfortable. Professional medical team made a specific treatment plan for me immediately, and suggested me taking interventional therapy and natural therapy. During the first treatment, I got two sessions of interventional therapy and one session of natural therapy. As I finished my first intervention, I got poor appetite, but three days later, it became normal. And I felt comfortable for my second intervention. What’s more, I felt much better after taking natural therapy without any side effects. Whereas, the intravenous chemotherapy that I received in the Philippines before had many side effects, such as sore throat, infection, hair loss etc. After one month, I went back to my workplace to ask for leave; my colleagues and friends said, “You look better than before, nothing like a patient now.” This is the second time I came for the third session of interventional therapy. I am so happy that my condition has improved a lot and all the indexes have become normal. In St. Stamford Modern Cancer Hospital Guangzhou, I made many friends. There were many Philippine patients, Indonesian patients, Malaysian patients, etc in the hospital. We talked and cared about each other. In the first time I came here, the Filipino patients told me that the doctors and nurses were so good here, and we could cooked by ourselves. Indeed, doctors, nurses, translators etc were very accommodating. They took good care of me, and always concerned about me, who were like my families. Especially I was very grateful to my attending doctor—Dr. Tang. Besides, there were many activities held for cancer patients in the hospital regularly, for example the mid-autumn festival party which I joined before. I could go outside here, and I had been to many places such as the Sacred Heart Church, IKEA. Chinese people are very nice. When we went outside, they always tried their best to speak English to us or found those who could speak English to help us. Thank the lord for guiding me to St. Stamford Modern Cancer Hospital Guangzhou. Cancer is a trial of my life. I must fight against it and never give up. Everything will become better only we trust the doctor and the treatment. In March 2017, Susan came back for recheck and the good news was her condition was rather stable with no tumor cells detected. It happened to be International Doctors Day, Susan sent doctors flowers to express her great thanks for advanced treatment and attentive service here. Susan also expressed her heartfelt gratitude to translators and nurses here for their thoughtful care during her hospitalization. 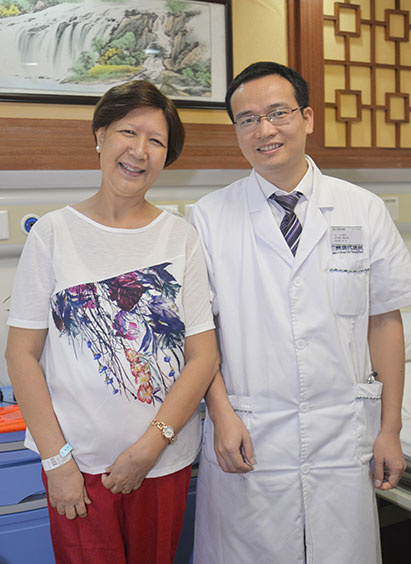 St. Stamford Modern Cancer Hospital Guangzhou not only focuses on the advanced treatment technology, but also provides humanistic services and comfortable environment which offer strong supplement to treatment and recuperation. Up till now, she has been surviving breast cancer for 5 years.